I’m Pokemon GONE. And the secrets of a PokeMom. Yes I downloaded the app. Yes I played Pokemon Go here and there for a few weeks. Yes I was freakishly good at it and got to level 15, though I haven’t taken over a gym yet. I downloaded the game originally for Jack, plus I wanted to see what all the hype was about. It seemed fun. People at work played as they walked around the building. Jack played a little on my phone but then went away to camp for two weeks, and away with his friend for another week, and now he’s in Arizona with his dad! Sheesh, the little app was all alone with no one to play with. I decided to check it out one day when Jack was gone. It was oddly satisfying to capture Pokemon one by one and use the camera function to show my neighbors that a rare Pokemon had landed in their front yard! I loved the Pokestops and spinning the wheel, and the bubble pop sound as you collected treasures and the much needed Pokeballs. It spoke to my sense of order and my enjoyment of collecting things. Plus, I walk a LOT and that’s just conducive to hatching a lot of eggs. Don’t judge! me: Jack I powered up a few Pokemon while you were away. Did you put the app on your iPod? Jack: No I’m not even that interested in it mom, plus they can access all your info. It’s not safe. I didn’t really hear that last part. I played a bit more and liked how it tracked my movement and that I knew where the Pokemon were gathering in my town. 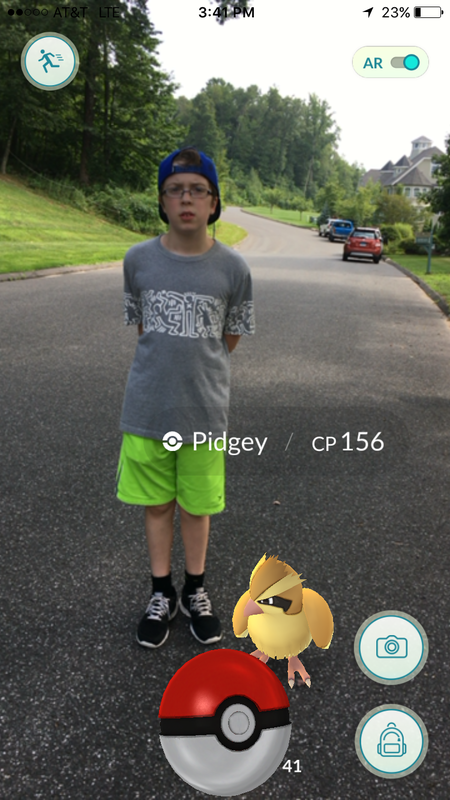 I invited one of Jack’s friends to go on a Pokewalk with me because I missed Jack! And his friends all need exercise. Win win! Jack: Mom why are you face timing me in the road? me: I’m collecting Polemon at the big stop sign near the old cemetery. Jack: Can you give home the phone?? There was a series of “Dude”, “So lame” and “DUDE!” and then I got the phone back. Jack: Mom, this is a game for KIDS! I felt only slightly chastised. So I played some more here and there and happened to develop mad Pokemon catching skills. What can I say, I enjoyed it! Is that a crime? And then I noticed something. I got an email alert “just letting you know another gmail account (not mine) was linked to your gmail… If this was not you, take these steps to fix it.” So I did. And forgot about it. But weird right? I sort of remembered someone telling me that my email information could be compromised if you downloaded and logged into this app. Well, not someone, just this one smart little guy. Jack: You know Pokemon Go can access all of your information right? I told you. You shouldn’t do it Mom. He reminded me again on our next call when I told him about the weird gmail account. me: Yeah but if everyone is playing it, it should be ok I think, right? So I kept the app and we played a bit more. Jack and I would take walks with his friends and catch Pokemon. During lunch I would go next door with one of my interns to our usual Pokestop and we’d hang for 10 minutes to let it refresh so we could collect twice the booty. We knew how to work the system, and I learned how to throw mad curve balls to catch the harder Pokemon. Why isn’t it PokeMEN? Hmmm. Again when I talked to Jack he gave me an earful. Only after I told him I had a super high CP evolved Rhyhorn. Jack: I TOLD you! They can get into all of your information! You should just delete it Mom. me: But I like it! Then it happened again. I wasn’t able to retrieve my gmail on my phone. This was the same account that I had just repaired a week or so ago. The password was just flat out changed by someone in CT at a time when I was out at dinner. Luckily I had been checking my secondary gmail account (randimly) which was the backup email address for my REAL gmail account. Sigh… I took all the steps to change the password to this account. Then I decided to Update all the security features and noticed that now BOTH of my accounts said “Pokemon Go has access to all of your gmail account info.” And I had only used ONE account to login. That was it. DEE-LETE! Gone. Not worth the hassle and potential for disaster.I sadly erased the account. It had to be done. I mean, come on! Right? Goodbye my one and only low cp Pikachu. Goodbye my most powerful and evolved Flareon, and bye to the the cute Ghastly. And I will miss the chance to evolve my Koffing into a Weezing, because that’s just funny. Previous postGlad you’re home. Goodbye again. Next postPositive reinforcement for dogs, husbands and children. I am so glad I read this! I downloaded this game, got the same warning from gmail and then had a 5¢ international charge from China on my back account. Deleted so fast!